It can be a very challenging and emotionally complex decision to admit someone you care for into a nursing home facility. Such decisions are usually not made lightly. They arise from necessity when a loved one can no longer care for themselves and there are no family members who are qualified or capable of providing the care that they require. Most will do research to find the best nursing home facility that they can also afford. It is devastating to find out that the people you have entrusted your loved one’s care to have been negligent, neglectful, or even abusive to someone who requires the highest standard of compassion and attention. The first thing that you need to know is what forms of nursing home abuse and neglect are most common and how to spot the signs of such negligence when you visit your loved one. It is important to visit frequently so that you will quickly become aware of any changes, and also to ensure that your loved one has the best quality of life and companionship. Some of the most obvious and apparent signs of neglect or abuse include broken bones, bruises, cuts, and other visible and notable injuries. While accidental falls do happen, it is not something that you should take as a matter of course. 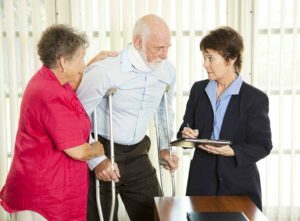 The nursing home staff should be present and capable, ensuring that your loved one does not fall and is not dropped. If your loved one has a broken bone, bruises, or cuts, especially if it happens more than once, you need to take action to ensure that he or she is well cared for in the future. In some cases, these are indications of actual physical abuse, while in others, it is a product of neglect. Then, there are the signs of bed sores and infection. A bedridden patient needs to be moved frequently to prevent bed sores. If your loved one spends all of their time in bed or sitting in a chair, then they are at risk of getting these extremely painful wounds if they are not moved at regular intervals. Then, if bed sores are not noticed or not treated adequately (or at all), then they can result in infections, like sepsis. You will need to actually check your loved one for bed sores, especially if you see that he or she is almost always in the same position when you visit. Another indication of neglect can be found in dramatic weight loss from malnutrition and/or symptoms of dehydration. You may notice that your loved one’s lips are dry, that their skin is dry, and that they are eager for any food or drink that you offer. He or she may grow weaker as time passes and their mood might become more despondent. Any time you notice mood or behavior changes in a nursing home patient, you should be on the lookout for further indications of neglect or abuse. In many cases, a patient is not able to communicate or is afraid to speak about what is happening to them. For this reason, many instances of nursing home abuse and neglect, including sexual abuse, go unreported. If you notice that your loved one is experiencing problems from a medical condition that was previously controlled, or if he or she is displaying new symptoms, then it could be a case of inappropriate medication dosage. They may be given the wrong medication, not given their medication at all, or given medication at large doses to keep them compliant. Why is Nursing Home Abuse and Neglect Such a Serious Problem in Indiana? The reality is that nursing home abuse and neglect is not more serious in Indiana than in other states, and this because many states are dealing with the same challenges. This includes understaffing, undertrained staff, and of course, the fact that many patients in nursing homes are not able to express their needs or the abuse they endure. Indiana has over 515 Medicaid and Medicare certified nursing homes, with only 3% of them being located within hospitals. More than 3/4 of all Indiana nursing homes are non-profit facilities. The issue of undertrained staff is significant, though to address this might further exacerbate the issue of understaffing. This is one of the most serious problems because the nurses who provide care to the nursing home residents are working very long shifts with very few breaks. Naturally, this makes it more challenging for them to provide the highest quality of care. There is a five star ranking system used by the Centers for Medicare and Medicaid Services (CMS) to rate nursing homes in the United States. These rankings are based on the facility’s health inspection ratings, the staff ratings, and the quality measure ratings. The health inspection ratings are based on inspections. The staff ratings are based on how many hours of care each nursing home resident is given, on average. The quality measure rating is based on how well the residents of the nursing home are provided for, physically and clinically. Indiana ranks as number 42 in the United States in the CMS ranking system. If you find this information alarming, you are not alone, and it is just one of the reasons that you should be hyper vigilant when it comes to the care that your loved one receives. It is important to take action quickly when you suspect abuse or neglect in a nursing home facility. You should remove your loved one to another facility to get them out of the situation. However, you should also contact the police to investigate. Any time you are suspicious about the care that your loved one is receiving or an injury they have experienced, you should take it seriously. Contact Rowe & Hamilton Attorneys at Law to schedule a free consultation and discuss your options for moving forward.